Five minutes before the kick-off of the last home game of the season against Chesterfield Neil Smillie was officially named as the new Manager of Wycombe for next season. Smillie was welcomed onto the pitch by Club Press Officer Alan Hutchinson after the surprise announcement. The decision appears to be a popular one with most Wycombe fans. It was later revealed that Smillie had been given a three year contract - the longest contract since Wycombe joined the Football League. Smillie will decide during the summer break who will be his assistant - Wayne Turner has been helping him since he took over at the beginning of March. The Club will also have to find a new Youth Team Manager to replace Smillie's previous role. Keith Ryan took all three of the Club Player of the Season awards for 1997/98. It was Keith's form since the departure of John Gregory that help seal the awards - including three goals in four games after Smillie allowed him the freedom to venture up field for corners. Ryan has been at Wycombe since the summer of 1990 and was Martin O'Neill's first signing. He has had two injury set backs in recent seasons both caused in non-First Team games but has recovered to take up the No.4 shirt this season. The three awards were voted for by members of the Official Blues Supporters Club, The Independent Supporters Club and a poll from readers of the Bucks Free Press. Runners-up to Ryan in the BFP poll were Martin Taylor and Steve Brown. Ryan told the BFP "Along with playing at Wembley, this is the highlight of my career." Now Wycombe are safe for another season, this is the time for speculation and crazy rumours about who is coming or going from Wycombe Wanderers. The local press have taken it into their hands to set up a telephone poll for those who feel the urge to say YES or NO to whether Neil Smillie should get the Wycombe's Manager job. Add to this the fact that key players are at the end of their contracts and you have stories that will run and run. So in summary - will Steve Brown and Dave Carroll sign new contracts? Will Michael Simpson and John Cornforth be released to cut the wage bill? Will Jason Cousins ask to come off the transfer list - does it depend on Smillie staying? We don't know the answers yet but when we do we'll let you know? JIM EARNS ANOTHER DRINK Wycombe's Groundsman Jim Gardener has been awarded the joint runner's-up prize for the best pitch in Division Two for season 1997/98. He shared the award with Grimsby Town, with the top place going to Bristol City. Two years ago he won the award that is voted for by visiting teams and referees. 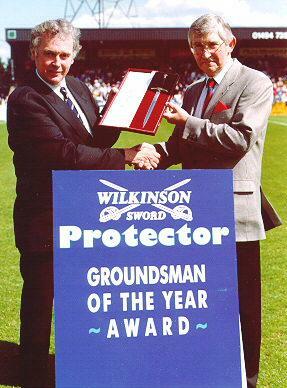 Jim took the role as Groundsman at Wycombe at the start of the 1992/93 campaign after Wycombe's previous groundsman Rod Lavers left after nine years at the Club. Wycombe fans may remember the poor state of the Adams Park surface at the end of that season after the Club had ignored advice and trained and played on it during frosty conditions. Thankly the Club have learned from their mistakes and now boast one of the best surfaces in the Football League. Jim's dedication sees him forking and manicuring the surface at half-time and after the final whistle, before heading to the bar for a well earned drink or two. Wycombe's 0-0 home draw with Millwall on Saturday means Division Two safety for another season. Wycombe now have 56 points (one more than last season) and have two games left to play - home to Chesterfield (Sat 25th April) and away to Walsall (2nd May). KEITH RYAN was named the Wycombe Wanderers Official Supporters Club Player of the Season 1997/98 prior to the game with Millwall. The Independent Supporters Club Player of the Season will be announced next week before the game with Chesterfield. Following the crucial win at Oldham on Easter Monday, Wycombe need 4 more points from the remaining three games to be mathmatically safe from relegation. However, with so many teams fighting to avoid the drop, Wycombe could be safe after Saturday's home clash with Millwall plus some good fortune in games elsewhere. Mark Stallard will miss the home game with Millwall on Saturday through suspension but will have the remaining two League games to attempt to become Wycombe's top scorer in a Football League season. The record is currently held by Miguel DeSouza who scored 18 in the 1995/96 season. Stallard's goal at Oldham was his 16th League strike of the season. As expected Wycombe have resigned from the Capital League to join the Football Combination. A mass departure by five other Football League sides led to Wycombe's decision to leave after 13 years in the 'reserve' league. On the injury front, Paul McCarthy will miss the rest of the season after failing to recover in time from a hernia operation. Steve McGavin is still out with a foot injury and Michael Forsyth is also out for the season. Keith Scott missed the win at Oldham through flu and hasn't trained this week but could still make the squad for the Millwall game at Adams Park. Wycombe will still be without Steve McGavin for the home clash with Grimsby on Good Friday. McGavin picked up a foot injury in the home game with Bristol City and has failed to recover during this week's training. Paul McCarthy is also struggling to make a comeback this season after his hernia operation. Wycombe have put all player contract negotiations on hold until the end of the season. This mainly affects Steve Brown and Dave Carroll who are the only regular first-teamers whose contracts expire in the summer. Apparently both have been told that new deals will be offered but Manager Neil Smillie doesn't want money talk to affect the form of the team. Paul Read scored another hat-trick in the reserves 5-2 victory over Orient in the Capital League on Wednesday. Ben Hodson and Lewis Reid scored the other goals. Wycombe gave a run out to Derby County youngster Ross Greenhill and Arsenal's Nando Perna in the same game. Wingback Greenhill impressed and could sign for the Wanderers. Wayne Turner is Neil Smillie's new Assistant Manager. Turner was a team-mate with Smillie at Brentford and was recently First Team coach at Luton Town. 37 year old Turner is also a former apprentice at Luton and played in their Division Two Championship season of 1982 before moving to Coventry City and then onto Griffin Park where he teamed up with Smillie. Turner told the local press he wants to help Smillie get the job a long term basis. He said "I'd love to work with Neil next season. He has the organisation, the knowledge and the respect of the players". Wycombe may withdraw from the Capital League next season after a mass-exodus by five other Football League teams. Gillingham, Peterborough, Fulham, Northampton and Barnet have opted to join the Avon Combination which includes several Premier League teams. Wycombe, who have been members of the Capital League since 1985, are also likely to resign and look for a higher quality competition. Wycombe's game against Grimbsy next Friday (10th April) is the one of only a handful of Football League games to played in the South of England and the Club are hoping for a bumper gate. Kick-off is 3.05pm and all children under 16 will be admitted for �1 or for free if they are wearing an official Wycombe replica shirt. Tickets must be brought in advance from the usual outlets to qualify for this offer. The transfer deadline came and went for Wycombe without too much activity. Despite rumours and speculation that Keith Ryan maybe on his way to Villa Park, Ryan stays on for the remainder of the season at least. Wycombe's only action in the market was bringing in youngster Lee Holsgrove from Millwall. 19 year old Holsgrove, who plays at centre-half, has failed to make the Millwall first team but became Neil Smillie's first signing as Manager. Lee's 15 year old brother Peter plays for the Wycombe Youth Team while his older brother Paul has spent the last four seasons at Reading. Wycombe's small squad will come under considerable strain as the season draws to close. Michael Forsyth, injured in last week's defeat at Wrexham could miss the rest of the season, while Paul McCarthy is also still out. Wycombe have seven more games to ensure their Division Two safety for another season and probably need another 6 points to be 100% sure of beating the drop. Sounds easy? Let's get the points first, then start the crazy talk of sneaking in the play-offs! With all the gossip about who's going to be the new Manager now put on hold until the end of the season, the speculation now turns to whether Keith Ryan will be whisked away from Adams Park. Gregory at Villa and O'Neill and Leicester have both been keeping a look at 'Rhino' who has scored three goals in the last four games. The transfer deadline is on Friday 27th March and Neil Smillie has indicated that any serious offer for 'Rhino' would "have to break this club's record fee (�375,000)". Smillie has no money to spend on players himself but could look to further loans to help him out for the remainder of the season. Smillie will also announce his new assistant next week. Good news for Nicky Mohan and Steve Brown who have both gone five games without a caution and therefore loose a booking towards their next suspension. Since Smillie took charge, Wycombe's 'crime-rate' has taken a nose-dive. Under Gregory the Wanderers picked up over 60 bookings this season - one of the worst records in Division Two. Neil Smillie has been named the new Manager of Wycombe until the end of the season. Chairman Ivor Beeks informed Smillie of the Board's decision on Friday but Smillie asked for the news to be kept from the players and the media until after the game with Plymouth Argyle the following day. Ivor Beeks announced the news in the Vere Suite at Adams Park after the 5-1 victory over Argyle and said he "we would have to wait and see what happened at the end of the season" but added "we wish him all the best" The decision was greeted by cheers by the supporters in the bar. On loan defender David Kerslake has ended his three month loan spell at Wycombe one match early and has joined Division One Swindon Town on an 18 month contract. Kerslake was offered a contract until the end of the season by Wycombe but opted for the move back to his former club. John Cornforth's move to Peterborough has been scuppered by food poisoning. Apparently he ate a dodgy bowl of tagliatelle while his wife was away. His loan period with Posh ends on Saturday 14th March. John Gregory is the new Manager of Aston Villa. The story, announced on Wednesday 25th February, came as a shock to most Wycombe. Gregory joined Wycombe in October 1996 from Villa and was contracted until the end of this season at Adams Park. Speaking at a press conference at 5.00pm on that Wednesday, John Gregory said "It is a great opportunity. I didn't need too long to think about it and I certainly didn't want this chance to pass me by" Apparently Gregory was approached by Villa shortly before Tuesday's game at Bristol Rovers. Wycombe's Chairman Ivor Beeks was told by Gregory of the approach by phone after the final whistle and arranged to meet the next morning. By Wednesday afternoon Gregory had travelled to Villa Park while Beeks and Villa's Chairman Doug Ellis had agreed the terms for releasing Gregory. Gregory's goes straight in at the deep end for his first game with the visit of Liverpool to Villa Park on Saturday, followed by the midweek trip to Athletico Madrid in the UEFA Cup. Meanwhile at Wycombe assistant Manager Richard Hill has also resigned so Youth Team boss Neil Smillie takes over as Caretaker Manager again for Saturday's home game with Gillingham. Smillie was in charge for a few games after Alan Smith was kicked out at the start of October 1996.